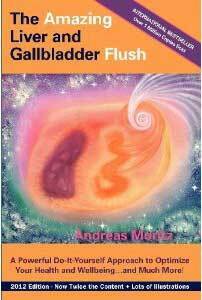 Reading Andreas MORITZ's book "The amazing liver and gallbladder flush" fascinated me. The function of our digestive system, its importance, its interaction with the rest of the organs is described with great attention to detail. An attentive read that brought me a much better understanding of the mechanisms that govern our health. Besides a great deal of practical advices to optimize these functions, the author gives an overview on his main subject which is the liver and gallbladder cleanse. Andreas Moritz died October 21st, 2012. - For some years I had suffered difficulty digesting, and a copious meal was now systematically hard for me to digest. - Frequent tendinitis in the elbow . - Often painful finger articulations. - Occasional pain between the shoulder blades, which gave me the opportunity to sponsor my osteopath. - Appearance of liver spots on my left hand, the first one having come out between the thumb and the index in 2008, when I was 45 years old. - My belly had swelled, in spite of me to being overweight. I had attributed that to my age (47) but maybe it is also the consequence of a clogged liver. 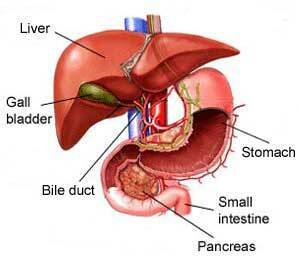 What causes blockage to the liver and gallbladder ? 1) Gall-bladder gallstones are real stones which occasionally reach a considerable enough size that they cannot be expelled anymore. Furthermore, these gallstones can adhere to the inner wall of the gallbladder, which causes their removal to be even more problematic. These gallstones are visible on radio and are the only ones recognized by medicine, which in case of strong pain can recommend removal of the gall-bladder. The goal of the gallbladder is to proactively purge itself of mud and sand before it coalesces into larger gallstones. For more accurate information regarding the size at which gallstones can be expelled from the gallbladder, please read the NB further down "remarks on the composition of my samples" on analysis page. We must already accept to challenge years of mistakes as docile consumers, which is not the easiest of task. I read a maxim that seems very fair: "the quarter of what we eat nourishes us, the other three quarters feeds our doctor." The information is available, he who opens his eyes and seeks it will necessarily avoid the pitfalls. Food however is not the purpose of my website. With skin and lungs, what needs to be done is straightforward. In relation to the kidneys, there are several remedies that can be used to cleanse them. More attention needs to be paid to the liver and intestines, which must be considered a pair and simultaneously addressed, this is the subject of my testimonial. The results are almost immediate and easy to measure. What is the role of bile ? - Digestion: Salts contained in bile can dissolve fats, so they can in turn be absorbed by the intestine. - Detoxification: The liver cell can dissolve many fats (including cholesterol) to excrete them in the bile, this is the detoxifying function of bile. --> A lack of bile, caused by a congested liver, will have a significant impact on our health, because we wouldn't be able to remove all the fat toxins that our liver is responsible for getting rid, neither digest fats for which our body has a vital need for. how does the gallbladder empty itself ? Measurements by ultrasonography during a liver cleanse, performed by Bruno X, in the radiologist's office. Step 1: The gallbladder is at rest, filled with concentrated bile. It’s volume is 15 cm3. Bile can’t pass into the duodenum. Step 2: When the bolus enters the duodenum, the liver increases its production of bile to put pressure on the gallbladder. The volume of the gallbladder reaches 23 cm3. 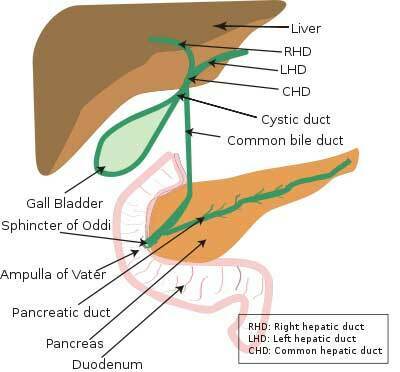 Bile still can’t pass into the duodenum. Step 3: When the gallbladder has enough pressure, the input is released into the duodenum (the ampulla of Vater opens the sphincter of Oddi). The gallbladder and the liver, both pressurized, can then expel the bile into the duodenum to complete the digestive process. The volume of the gallbladder drops to 10 cm3. It was a rapid decision and reading the book convinced me: I had to perform this famous «cleanse». The protocol described by A.Moritz asks for a little organization, but it is of great simplicity and very cost effective. All the ingredients mentioned in the "recipe" (malic acid, magnesium sulfate, grapefruit, olive oil, black walnut hull tincture and Ornithine) are less than 10 dollars for one cleanse. For 6 days, drink malic acid, in the form of organic apple juice, or in powdered form diluted in water. The malic acid softens the calcified balls of fat and this will facilitate their transit towards the exit (we are here talking about the balls of fat of the liver, not the gallstones of the gallbladder, we wouldn't be able to soften a stone). We ingest magnesium sulfate, which dilates the bile ducts and thus enlarging the passage for the balls of fat and small gallstones. Then we drink a good quantity of oil mixed with the grapefruit juice. The oil that reaches the intestine releases a signal for the liver and the gallbladder to send bile in great quantities to begin the digestive process and at the same time expels the balls of fat and the small gallstones into the duodenum (first part of the small intestine). All this is then excreted because magnesium sulfate is also a powerful laxative.